The Cross House was built in 1894. While 1894 living rooms, dining rooms, bedrooms, and even bathrooms are not radically different from the same rooms today, kitchens are. And few people owning an old home would want a period-correct kitchen. 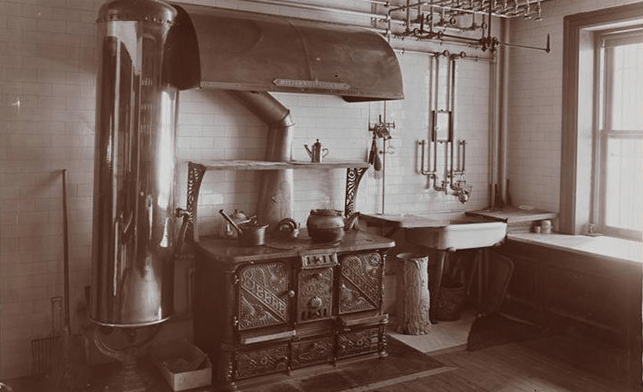 Kitchens in 1894 did not have refrigerators (which became common post-1920), dishwashers (which became common well after WWII), or microwaves (1970s). Nor central air. Nor a flat-panel TV on the wall. Counters were lower than they are today (36-inches is now the standard, but I prefer counters 1-1/2-inches higher). In 1894, cabinets were few. Today, people have cabinets galore. Most significantly, for all houses but the most modest, kitchens in 1894 were the territory of servants. Today, this is rare to the point of nonexistence, and home-owners now live in their kitchen. 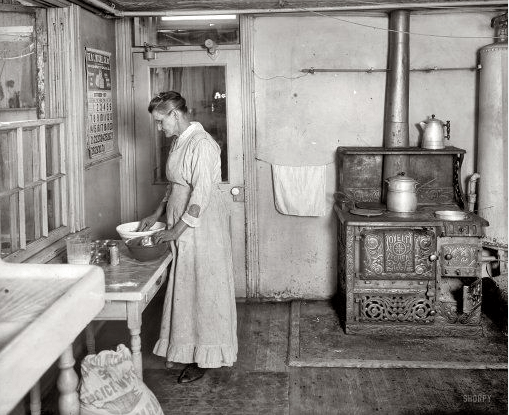 Because 1894 kitchens (or any pre-WWI kitchen) were the domain of servants, they were as plain as could be. Today, kitchens are often the fanciest in the house, and certainly the most expensive per square foot. In pondering how to create a kitchen in the Cross House, I have been researching historic kitchens. I have also been looking at a lot of new kitchens in old houses. And one thing slaps me in the face. 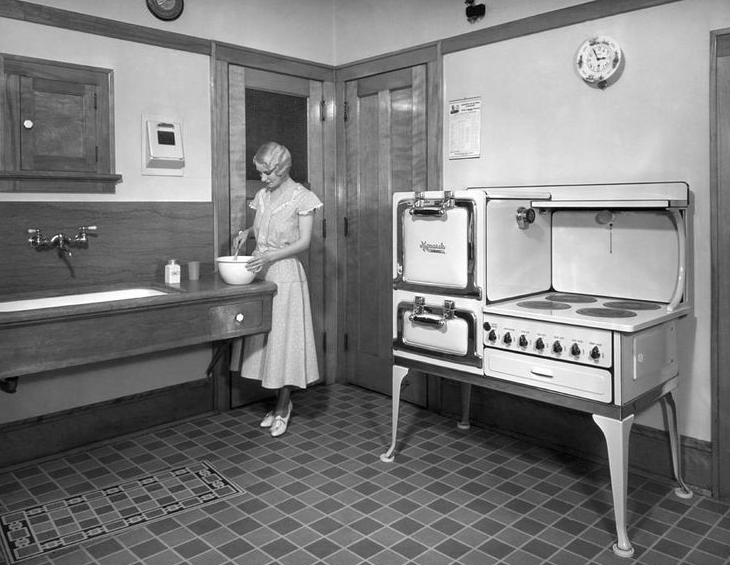 Almost without exception, I find archival images of historic kitchens fascinating & fabulous. What a cool room, I think, in awe, as I stare at image after image and drool. However, almost without exception, when I see a new kitchen in an old house I kinda grimace. Sometimes I cringe. I almost never think: Well done! It is rare to find an intact kitchen from before WWII. Yet intact butler’s pantries abound. Curiously though, few people take cues from their intact butler’s pantry in fashioning their new kitchen, even though their stated intention is to create an age-appropriate kitchen. Well, will you join me in a walk through time? In Part One of…A Kitchen Adventure! Image circa-1890. The Cross House also has a brick chimney stack, and wood wainscoting. 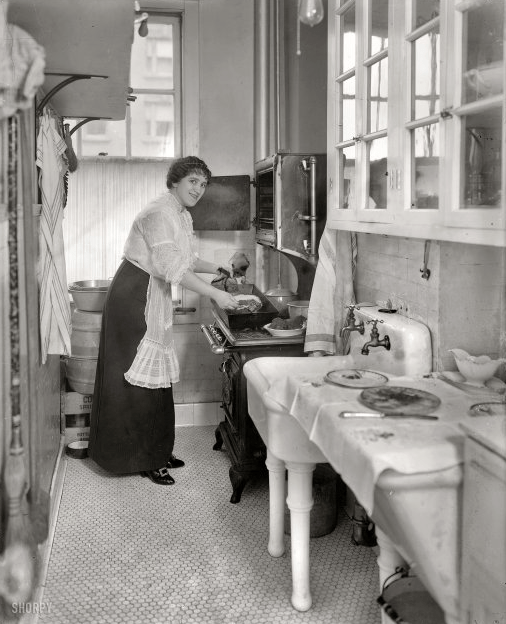 While today we look at such an image and gape at the primitive nature of the kitchen, in its day the kitchen would have been a marvel of modernity. Indoor plumbing! A coal/wood stove rather than an inefficient fireplace! Gas lighting! Hot water! Circa-1890. Note the subway tile walls. A look highly popular today. I am agog at the plethora of piping, and a little in love. 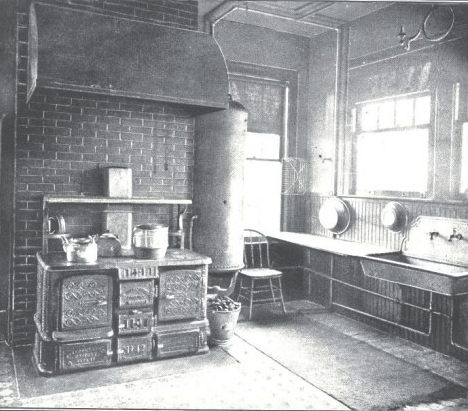 The image is dated 1917 but the kitchen is older. The kitchen would have been in a very modest house. I would love to go back in time and surprise the very tired-looking woman with an all-expense paid trip to…anywhere but this kitchen. 1910. I could easily, and happily, live with this. Could you? NOTE: there appears but one light bulb in the room. That, I could not live with. Circa-1914. IMAGE: G.G. Bain Collection. 1920. I love how gleaming everything is. 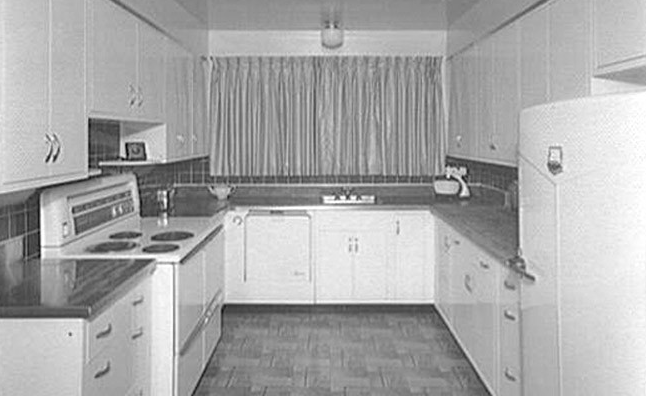 If I purchased an old home, and its kitchen was this gleaming (by some time-warp miracle), I would not change a thing. IMAGE: National Photo Company Collection glass negative, Library of Congress. …and certain homeowner. 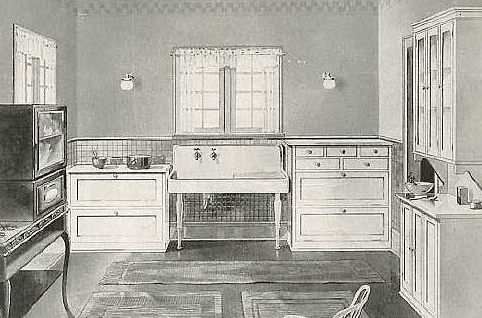 1930s kitchen. F A B U L O U S. Two questions though. 1) What is the small door over the sink for? 2) What is the curious device next to the curious small door? 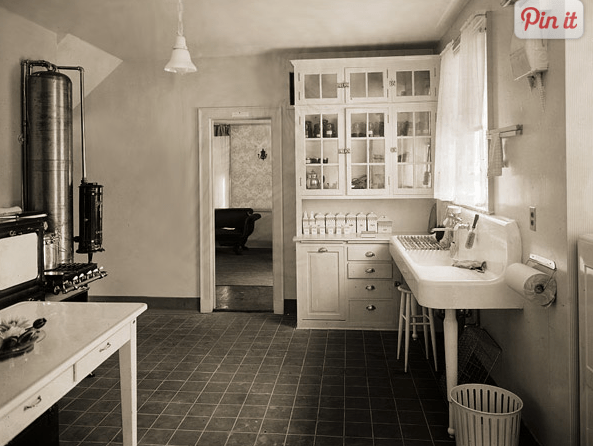 A 1936 “dream” kitchen. IMAGE: Carl Mydans for the Resettlement Administration. 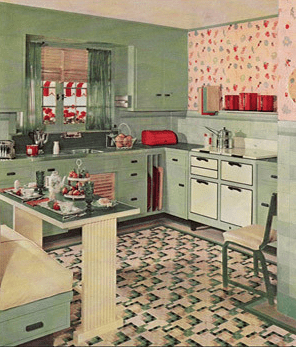 In the 1930s color kitchens became all the rage. I can appreciate why. IMAGE: “Dream Kitchens” brochure by Armstrong Cork. 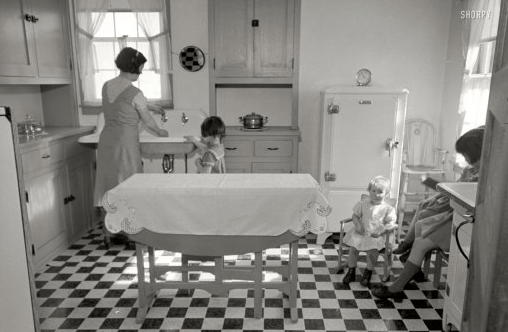 By the late-1940s kitchens had evolved to the point that this kitchen would be considered workable today. IMAGE: Theodor Horydczak. 26 Responses to Creating a New Kitchen in an Old House. Part One. These photos are AMAZING. What a treat to look at! One thing of note, of course, is that kitchen had auxiliary storage – root cellars for food kept the need for expansive cabinetry down. While I’m glad not to go to the basement for my flour and potatoes, I definitely struggled when designing my kitchen. I wanted it to look like it fit with the rest of the house, but it also needed to function well enough to host multiple dinner parties each months. My husband loves to cook (I bake), so we tried to incorporate Victorian elements but still make it function. Nerve wracking. A few key pieces (painted cabinetry, the reproduction 1896 stove, the marble floors, antique lighting) make it work. I think. Regardless, we love it so much, and I cannot wait to see what you research and design for the Cross house. My biggest problems with period kitchen design is that you only get to do it once, when they are soooo fun. I have been researching kitchens also. I may need to review what you have found when I am closer to redoing my “old house” kitchen. I really like many of those you have posted. Can’t wait to see what yours will look like. Getting so excited for what’s to come for your project and mine!! Have you ever seen The 1900 House series from Channel 4/UK? Gives you an idea on how hard it was for the women/servants to cook in those kitchens. I do not envy those women from way back when. I’m going to go kiss my microwave now. Someone has uploaded the series on YouTube, not good quality but I think it may be on Amazon too? And I forgot to include a link to a 1940’s video about the kitchen. I know it’s later than your home but thought you might find it interesting. The kitchen in the video is faboo-o-matic!!!!!! The “rules” for wives are terrifying! 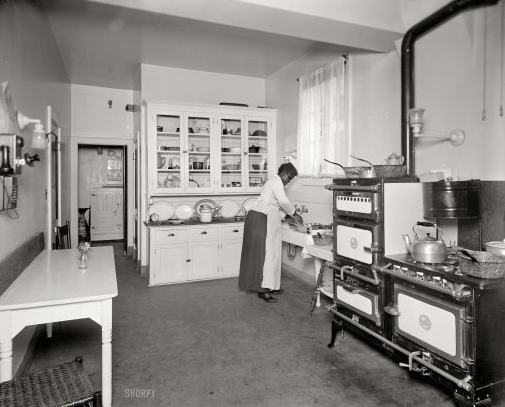 That 1910 kitchen! BRING IT ON. Ross, the second to the last picture is 1948-1951. There’s a Hotpoint dishwasher and refrigerator in there. Travis!!!! I bow to your expertise! And have updated the post (and moved the image in question to the bottom). Thanks!!!!!!!!!! 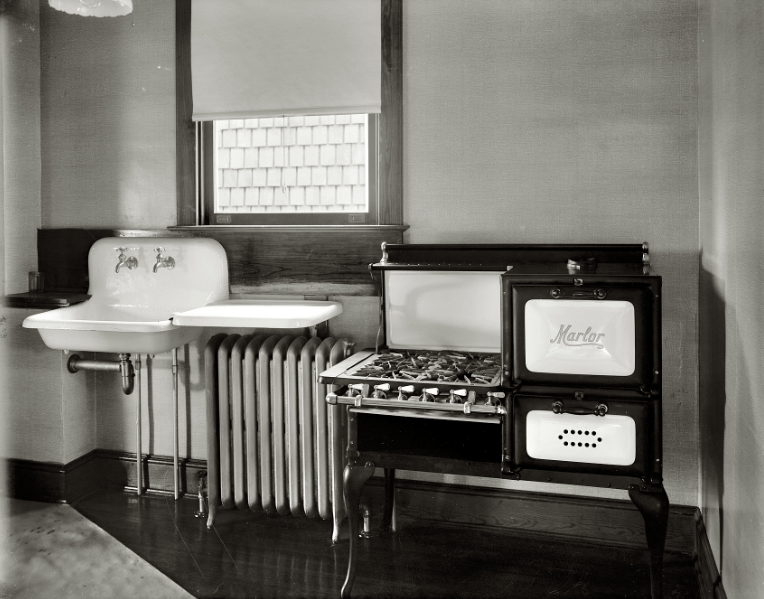 1910 and 1920’s kitchens are my favorite. But I love the sink and counter in the 1930’s kitchen. I definitely would not do a modern kitchen in that grand old house. I didn’t get any photos of the butler’s pantry in our favorite Atlantic City house, did I? The kitchen and butler’s pantry originally had subway tile about 5 feet up the walls (with the thick radius bullnose, which I think is critically important) and hex tile on the floors. The butler’s pantry had cabinets with flat paneled inset doors and chrome hardware. I think the wall cabinets stopped a couple feet short of the ceilings and had crown molding on top and brackets below, and I think the sink was wall mounted with legs. The kitchen looked more like the later ones in this post except that the subway tile was still in place behind the steel cabinets. I’m curious to see what you end up doing. True period style cabinets (that are not fancied up McMansion style) are great, though I think for me they’re out of the question. I love the old stoves! Great pictures. Ross, as a cook compiling a cookbook of my grandmother’s recipe cards, I am in awe of what her generation could create on stoves fueled by coal, wood, dried corncobs or cow patties. We are spoiled in our modern age. Food history is a fascinating aspect of social (and fashion) history. If you haven’t already, you might be interested in reading Christopher Kimball’s book “Fannie’s Last Supper.” He chronicles his attempt at recreating a classic meal from Fannie Famer’s 1896 cookbook, using the tools and appliances available in a well-equipped 1890’s kitchen. It’s a fun read, especially if you love food and old kitchens/homes. I can’t wait to see how you recreate the kitchen in your home. Love the pictures and the kitchens. I found a cast iron sink like the one in the 1910 kitchen and had it installed in my 1906 bungalow. I like taking my kitchen (and house) back in time altho I know it horrifies some who are longing for granite countertops. That first photo is an answer to my question in having an old house and kitchen that has little of the old. However the hood to the stove is so like what I have! Wow! Thanks. If you put in a microwave or a dishwasher, I will drive the 1800 miles or so to Kansas, break in and remove them surgically – hmmm – I’m thinking chainsaw. Oh dear! Well (I am now afraid to admit) I am planning to put in a microwave (in the pantry) and dishwasher. I firmly believe that kitchens should function well and be easy. But HOW such functions are handled is the trick! The little metal door in question is to an incinerator in the basement. A quick way to get rid of trash! Wow. so cool. Glad you told us that. tut tut tut – reduce reuse recycle and no hydrocarbon emissions. I know this is an old thread, but this and the related post address our current kitchen dilemma. We live in a house built in 1890 that has in the kitchen 5 doors/doorways, and 3 double-hung windows that are 20″ off the floor, and around 18″ from the ceiling. There is only one continuous wall in the kitchen, and it is 63″ long (the stove and refrigerator are next to each other on that wall, and the stove is right next to a very busy doorway). In order to creat wall space where none exists, a previous owner installed a wood laminate countertop and metal Youngstown kitchen cabinets right across one of the windows. They inserted a double stainless steel sink into the countertop and built beadboard cabinets directly onto the walls next to the window. The entire thing looks awful – the counter cuts the window in an extremely awkward way, such that it looks like the window is the wrong shape/size, the window is inoperable, the counter doesn’t sit flush to the wall because of the window trim, and the cabinets are rusted. BUT, having lived in the house for 7 years, we “get” why they did it this way, but we desperately want to change it, but don’t know how, because every potential change has a domino effect that leaves is right where we are. I cook 2 – 3 meals a day in the kitchen, and want to make it more user-friendly. I put a stainless steel table in the middle of the room to give myself someplace to work. I’d love to get the stove out of the traffic pattern and move the sink to reveal the entire window,, and restore it to working order. We’re not looking to put a zillion cabinets and granite and gadgets, etc. Less is definitely more where we’re concerned, but we are absolutely stumped by this room. We love the light that comes in (it faces east), and we ripped up many layers of vinyl and plywood to reveal the original wood floors. The photos of the old kitchens that you posted are wonderful and inspiring, but unfortunately, none shows anyone dealing with or working around low windows in addition to the many doorways. Does anyone have any advice or suggestions? We’ve scoured the Internet for pictures of old house kitchens with low windows, but don’t like any of the solutions that cut across the windows. We were faced with a similar challenge laying out the kitchen in our Foursquare. It is relatively modest (10’x11′), and has three full-size doorways, and a one large double-hung window, which was about 30″ off the floor, and 10″ off one wall. After trying many different ideas to work with it, we ended up moving the window up and over to clear standard cabinets (and center it over the new sink location). There was room for the full-height window to move up, and It’s on a less-visible side of the house that has a lot of original odd-size windows anyway (stair landing, small bathroom window, etc) so it didn’t create any problems with exterior proportion or symmetry. I also moved one doorway (goes to the mudroom) over about 4″ to clear standard-depth wall cabinets, and built a custom jogged base cabinet to clear it. Both of these changes are completely undetectable if you didn’t know how it used to be, and allow adequate counter space in an otherwise small and awkward kitchen. We also have the original connected pantry, which provides a lot of storage space. Plus, as a final bonus, moving the window inspired me to ditch the asbestos residing and repair and restore the original wood clapboards and trim beneath on the entire house. Have you considered a more freestanding sink that might work in front of the window? So, in short, maybe there are some subtle adjustments that would give you more freedom to add counter space. That combined with bending some rules on standard cabinetry may give you some more options. I believe that a good option for us would be to raise the window that is currently behind the sink, as you described having done in your home. 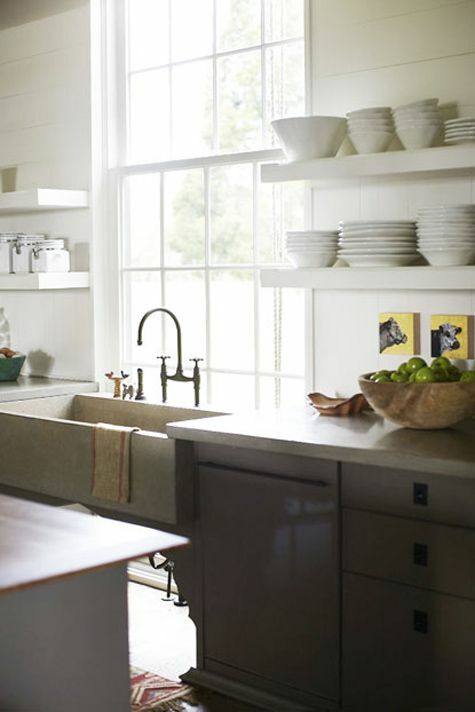 (And, thank you for the link to the image where the farmhouse sink is in front of a low window.) I think one of our problems is trying to work with what is currently in the kitchen. If we take it all down, we might see more options. (The upper cabinets, although extremely solid and sturdy, feel just plain wrong in there.) We also love the idea of more freestanding pieces, and are considering options along those lines. We’re also trying to solve the mystery of where the sink was originally situated in the house – there’s a stove pipe cover on one wall, so we know where the original stove went. Might a sink originally have been placed next to the stove on an inside wall? And, we are also considering relocating the kitchen to the adjacent mudroom/laundry room, which was added on to the house around 30 or 40 years ago. It has 2 uninterrupted walls, windows that are approx. 38″ off the floor, and is such that it could possibly be a very user-friendly, cozy galley kitchen. But, that room has become the main entrance to the house (we don’t ever us the “real” front door,of the house, because the mudroom entrance is more convenient. ) The mudroom leads directly into the current /original kitchen through the original back door to the house, so relocating the kitchen would remove the kitchen from the “center” of the house, and also have the added inconvenience of serving triple duty as a kitchen/mudroom/laundry room. I once toured a restored 1910-1920 home that had doors at a height and size similar to those over the sink in the picture of the 1930s kitchen. They opened to a builtin pie cooling cabinet. It was on an exterior kitchen wall and on the outside there were screened openings that allowed air to enter the cabinet. Inside the cabinet there were a couple of shelves large enough to hold maybe two or three pies each. There are similar pieces of furniture called pie safes, but this was built into the wall. My guess is that the curious device next to it is a 1930s version of an annunciator, probably electrically operated. I notice what looks like an electrically operated bell (like a doorbell) high on the other wall over the oven. I would imagine that the owner could press a button in any of several rooms of the house and it would ring the bell signaling that he required a servant. The annunciator box would tell the servant which room the owner had pressed the button in.